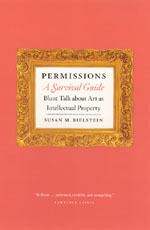 Museum News has praised Susan M. Bielstein’s Permissions, A Survival Guide: Blunt Talk about Art as Intellectual Property. From the review: "[Bielstein] gives life to what could be the driest subject ever with chapters such as ‘Permissions: A Love Story,’ ‘Privacy Woes and the Duchess of York,’ and ‘Doing and Saying Whatever It Takes.’ And besides enjoying the tongue-in-cheek prose, readers will learn how to determine if an artwork is copyrighted, how to get a high-quality reproduction, and what ‘fair use’ is." If a picture is worth a thousand words, then it’s a good bet that at least half of those words relate to the picture’s copyright status. Art historians, artists, and anyone who wants to use the images of others will find themselves awash in byzantine legal terms, constantly evolving copyright law, varying interpretations by museums and estates, and despair over the complexity of the whole situation. Susan Bielstein offers her decades of experience as an editor working with illustrated books. In doing so, she unsnarls the threads of permissions that have ensnared scholars, critics, and artists for years.